To increase awareness of Conservation Police Officers (CPO’s-previously called game wardens) activities, the “Virginia Conservation Police Notebook” provides an overview of activities encountered by our officers who protect natural resources and people pursuing outdoor recreation in the fields, woods and waters of Virginia. These reports are prepared from the officer’s field notes by Kim McCarthy, Executive Assistant to Major Scott Naff [Operations] and Major Bryan Young [Administration] of the Law Enforcement Division of DGIF. These CPO reports show the value of concerned citizens, landowners and true sportsmen in providing tips to law enforcement officers on suspected violations by lawbreakers who give other outdoor enthusiasts an undeserved bad reputation. National Night Out – On August 5, 2018 Richmond County hosted its first National Night Out event in the Warsaw Town Park. Virginia CPO Amanda Nevel worked with Richmond County Sheriff’s Office, and the Warsaw Town Police Department over the last few months to plan the event. The 1st National Night Out event was a success with free food, a dunk tank, DJ, bouncy house, and games for the public to enjoy. The Sheriff’s Office, Town Police, Fire Department, Emergency Services, DGIF, ABC, and other local vendors represented the county well. The kids especially loved special guest CPO K9 Bailey and K9 Officer Patrillo! 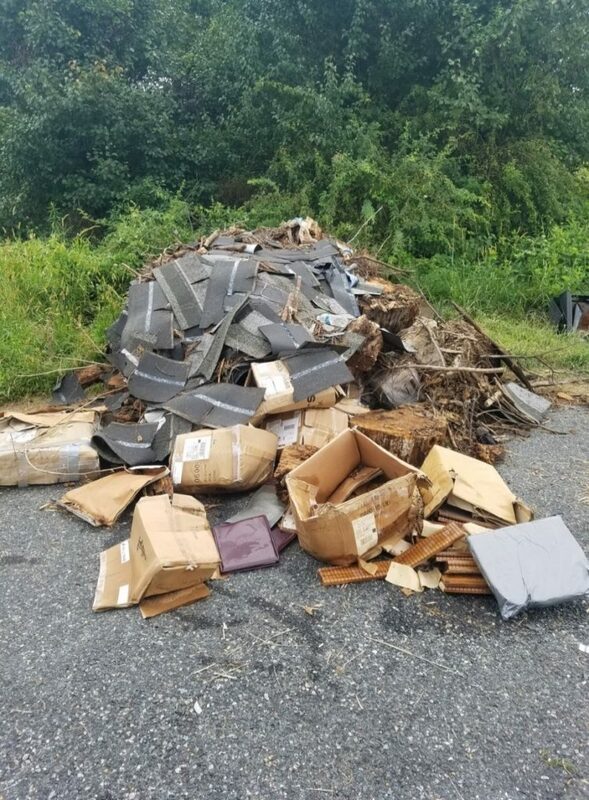 Dumping Suspect Identified and Charged – On Aug. 20, 2018 Virginia CPO Braziel was on routine patrol and checked the cul-de-sac located at the end of Whedbee Carroll Lane, in Chesapeake, VA. When Officer Braziel arrived at the end of the road, she noticed a large mound of trash that had been recently dumped. The trash consisted of shingles, roots, sticks, and several boxes. Inside the boxes held information for the army science conferences from 2003, 2004, and 2005. The outside of the boxes had the name of a company called TMC Design Corporation, which is located in Smithfield, VA. Through a thorough inspection of the boxes, Officer Braziel was able to locate a name and number for an individual, which she later called. Officer Braziel explained that sensitive company information was dumped on the side of the road. The company was upset and explained that they were in the process of cleaning out and had hired a company to dispose of those sensitive documents. The company advised Officer Braziel that they would be sending out an individual to pick up the documents. Approximately 20 minutes later, Officer Braziel got a phone call from a male, advising that he was at the location picking up the boxes for the company. Officer Braziel advised the individual that she would be coming to speak with him about the situation. After 10 minutes of listening to a made up story about how the pile of debris got there, Officer Braziel knew that this individual was lying. After some more discussion about the facts not lining up, Officer Braziel asked the individual if he was the one who dumped this trash, and he subsequently confessed. He said that he had dumped the stuff on 8/19/18, because he had a job to do on 8/20/18 and the dump was closed. Officer Braziel charged the individual for the violation. OUI – During the evening hours of August 18th Virginia CPO’s in District 13 patrolled several boat ramps and fishing areas targeting impaired boat operators. Officers Wakefield and Wiedel observed a boat come into Willoughby Boat Ramp in Norfolk at approximately 1930 hours. Officer Wakefield asked the boaters if they had any luck fishing and if they had fish onboard. He also observed multiple empty beer cans on the deck of the boat. Officer Wakefield was suspicious that the operator may be impaired. He asked the boat operator if he felt capable of driving home to which he responded no and indicated that a boat passenger was going to drive the vehicle home. At that time Officer Wakefield conducted FSTs and arrested the 20 year old male for operating a motorboat under the influence of alcohol. Undersized Sea Bass – On August 19th Officer Wakefield was patrolling the Bennett’s Creek area in Suffolk. He observed a fishing boat come into the boat ramp area and asked the occupant if he had any luck fishing. The man indicated that he caught some skates and other small fish. Upon inspecting his creel limit Officer Wakefield found 8 undersized sea bass. The largest of the illegal fish only measured 7 inches. Officer Wakefield issued him a summons for the violation. DGIF Booth at Richmond County Fair – During August 7 – 11, Virginia CPO Nevel set-up a DGIF booth at the Richmond County Fair. This fair averages over 10,000 participants from the Northern Neck and Middle Peninsula. The kids loved the special guests throughout the week including Suzie Gilley with her snakes and Officer Patrillo with K9 Officer Bailey. There were also local hunter education instructors volunteering some of their time at the booth to answer questions about upcoming DGIF workshops. Overall, it was a successful week at the fair with lots of questions answered and tours of the DGIF patrol boat. Teamwork Apprehends Suspect – On August 1, 2018, CPOs Cory Harbour, Matt Thomas, and Richard Howald, with his K9 partner, Sky, responded to assist Campbell County Sheriff’s Office with a wanted subject that had fled on foot when they attempted to serve a warrant on him. The CPO’s, utilizing their Tactical Tracking Training skills, worked with the Campbell County Deputies and State Troopers to conduct a man track that continued 3-4 miles through underbrush, briars, and rugged terrain. K9 Officer Howald, along with officers from all three agencies, ran the track following Sky after relieving the VSP K9 that had initiated the track. A short time later, the VSP K9, which is also trained to apprehend suspects, relieved Sky and took over the track again after the suspect had re-appeared and crossed four lanes of highway traffic only a couple hundred yards ahead of the tracking team. The team tracked the suspect to a field where CPO’s Thomas and Harbour were flanking the area when Harbour saw the suspect lying in the tall grass and began giving commands; the suspect initially stood up raising his hands but then dropped back down and began to move again. Harbour closed distance as the VSP K9 was about to be released, but fortunately for the suspect, he surrendered to the officers first. This was an excellent display of teamwork between at least three different agencies and two different K9 handlers resulting in a safe and successful outcome; and was another example of the benefit to the Commonwealth of the DGIF K9 Units for public safety along with protecting and preserving the natural resources. Hit and Run Still Being Investigated – District 21 and 22 Conservation Police Officers continue to investigate leads to locate the hit-and-run operator of a boat that ran between two early morning paddle-boarders on Smith Mountain Lake on June 22, 2018. Two sisters from Manassas were vacationing at the lake and out early to avoid the weekend crowds, when a boat approached at high speed and traveled between them. One of the sisters dove into the water just before the boat hit the paddleboard that she was riding. Her paddleboard was destroyed. The operator of the hit-and-run vessel looked back and kept on going. Had the 52 year old woman not jumped, she would have been seriously injured or killed. The investigation is continuing. Boat Incident – On Saturday morning August 4, 2018, at approximately 0030 hours near Oak Grove Boat Landing on Smith Mountain Lake, two teenagers from Franklin County were completing a fishing tournament. The bass boat that they were operating struck a floating dock that was floating just at the waterline, and traveling over it, causing approximately $1,000.00 damage to their boat. Fortunately, neither the operator nor passenger were injured. CPO Brett Clawson and District 21 officers are investigating in an attempt to find the owner of the dilapidated dock that could have been responsible for more serious damages and injury. Calls for Service Involving Children – On Sunday afternoon, August 5, 2018, CPOs patrolling Smith Mountain Lake were called to assist with a non-responsive one year old boy at the Smith Mountain Lake State Park. CPO’s from District 21and 22 arrived just as the child was resuscitated. The child was taken by rescue personnel to Bedford Memorial Hospital and is expected to fully recover. The same officers then responded to a second call for assistance relating to a five year old who had wondered off from family members. Luckily, he was found and taken to the hospital by his grandparents as a precaution. Trespassers Pick The Wrong Lock – On July 28, 2018, CPO Justin Rogers was contacted by the president of a hunt club in Cumberland County in reference to two subjects trespassing to fish on posted property. Using the information provided, Rogers was able to positively identify the suspects as individuals with whom he has had prior interactions. The suspects were no longer on scene, so Rogers conducted a follow up investigation which revealed the suspects accessed the property through a locked gate after cutting the lock. Rogers interviewed the suspects and obtained confessions in reference to trespassing and destruction of property. The appropriate charges have been placed. Law Enforcement Impersonator Grounded – On August 2, 2018, CPO Sergeant Tim Dooley received information in reference to a subject impersonating law enforcement on the Amelia Wildlife Management Area (WMA) in Amelia County. On August 5, 2018, Dooley was conducting covert surveillance on the WMA when he observed the suspect enter the parking area adjacent the lake. The suspect exited his vehicle and began instructing other visitors where they could park. The suspect was observed taking photographs and looking inside some of the unoccupied vehicles that were in the parking area. Sgt. Dooley made contact with the suspect while maintaining cover and the suspect instructed Dooley as to where he was allowed to park. The suspect, who was wearing a Fort Pickett hat, stated he worked for the Army National Guard Air Force. When questioned about his jurisdiction on the WMA the suspect stated “you can fly over it can’t you,” implying he had jurisdiction anywhere a plane could fly. The suspect stated he “patrolled” the WMA frequently while checking for safety equipment and fishing licenses and when someone does not have a fishing license he “writes them up.” Sgt. Dooley identified himself and confronted the suspect who admitted he did not work for the Air Force and had no law enforcement authority. When asked why he was taking photographs of vehicles, the suspect stated he was “pretending so people would believe him.” Charges are pending. Citizen Honored – On Saturday, August 11, 2018, Sergeant Karl Martin and Conservation Police Officer Dale Owens presented OPS Protector Challenger Coin # 17 to Cheryl Cochram at Smith Mountain Lake. 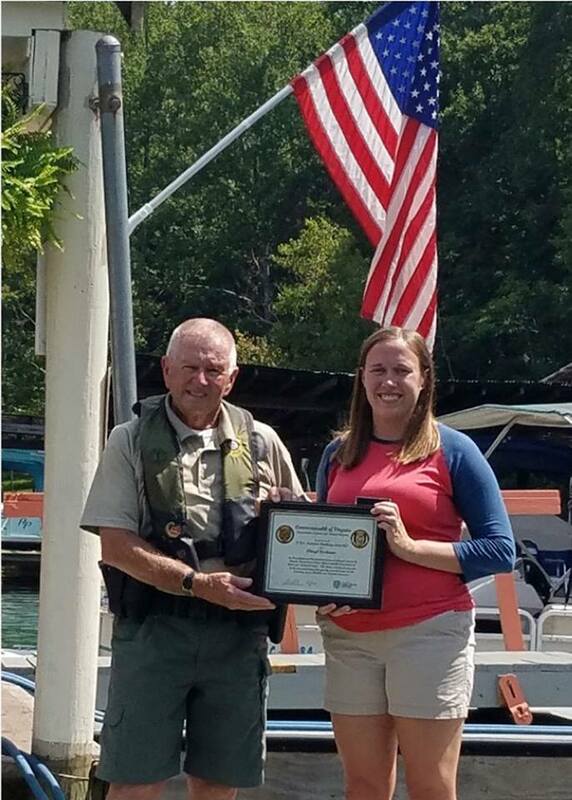 The coin, along with a framed certificate, were presented in recognition for her successful efforts to help save two seriously injured youngsters involved in a boating accident in August 2017. Her willingness to get involved and help people in distress and “not stand back and let someone else do it” were honored with the presentation not far from the site of her life-saving efforts. Boating Incident Leads to Serious Injury – On Friday night, August 24, 2018, just prior to midnight, a 19’ bass boat crashed into an unknown object on the Roanoke River Arm of Smith Mountain Lake. The 200 HP outboard engine bracket broke and the engine catapulted forward striking the operator and passenger in their backs. The 57 year old passenger was pinned beneath the heavy motor and seriously injured. Both men, who were from Roanoke, were transported to Carilion Roanoke Memorial Hospital. The operator was treated and released and the passenger remains hospitalized. Conservation Police Officer Brett Clawson investigated the crash and charged the 58 year old operator with failing to keep a proper lookout. Reckless Operation Leads to Crash – On Saturday, August 25, 2018, at approximately 3:30 pm, a personal watercraft, operated by a 20 year old man from Botetourt County, crashed into an anchored vessel near the railroad trestle on the Roanoke River Arm of Smith Mountain Lake. The operator of the PWC was charged with reckless operation by Conservation Police Officer Michael Morris. Blackouts Avoided on “UVA Day” – On August 26, 2018, Virginia CPOs Justin Rogers, Kevin Webb, and Sgt. Tim Dooley conducted a special operation which coincided with UVA Day on the James River in Buckingham County. UVA Day can best be described as a floating fraternity party facilitated by the local canoe livery which buses hundreds of students from the UVA campus to the river while providing them with inner tubes and coolers. The livery reported bussing approximately 800 students to the river this year. The operation was focused on public safety concerns due to alcohol consumption as well as littering violations. The officers positioned themselves in a popular location known as “blackout beach.” Over the course of one hour, the CPO’s were in awe as they estimated over one hundred alcohol cans floated down the river. Eventually, several large waves of students on inner tubes followed suit. An individual in the first group was overheard saying “let’s go blackout at blackout beach.” As the party commenced, the CPO’s observed a large percentage of the students consuming alcohol and discarding their trash in the river. Items left discarded included alcohol cans, tote bags, inner tubes, shoes, and even coolers. Several of the students appeared to be too young to possess alcohol. The officers confronted and identified 36 students committing a total of 39 citable violations. The appropriate charges are pending. Summons Issued to Three Fishing on Holston River – On July 28, 2018 CPO Nikita Burke was patrolling The North Fork of the Holston River in Washington County, when she observed a pickup truck parked adjacent to the river a short distance from posted property. Officer Burke was also able to observe a male subject fishing in the river. After speaking with the landowner, Officer Burke learned there were three male subjects who did not have permission to cross the property to gain access to the river. Officer Burke made contact with all three of the suspects found fishing and found that two of the three suspects did not have a valid fishing license and all admitted to Officer Burke that they did know the property they crossed was posted and had not obtained the landowner’s permission. Officer Burke issued the appropriate summons to all three suspects involved in the incident. Foot Patrol at Birch Knob Leads to Arrest – On July 31, 2018, Virginia CPO Dylan Harding was on foot patrol at Birch Knob in Dickenson County when he observed a male subject acting in a suspicious manner in a white Kia minivan. He was wearing no shirt, visibly perspiring, moving in an erratic and unsteady manner. Officer Harding observed the individual take a t-shirt that he cut into long thin strips and began doing something with it out of sight of the officer. Due to his suspicion, CPO Harding ran the plate which returned to a purple Honda pickup. He then made contact with the subject who stated he was alone and had driven up to hike the observation tower and was about to drive back to town. The subject provided a driver’s license with VOID stamped through it and did not provide a valid registration. When the subject’s information was checked, he returned as revoked. He also had active warrants out of Wise County. After confirming the warrants, CPO Harding placed the subject under arrest and additionally issued him summonses for the driving/license plate violations. Dickenson County Deputies assisted in transport of the subject. Reckless Operation of a Motorboat Investigation Complete – On Friday, August 3 2018, CPO Joe Early completed an investigation related to reckless operation of a motor boat occurring on South Holston Lake in Washington County. Officers Early and Sheets were patrolling South Holston Lake and received a call from the owner of a marina on the Virginia side of the lake. The marina owner indicated to the officers that an intoxicated subject was operating a motorboat in the no wake zone of the marina and was endangering people and property at the marina, coming within four feet of hitting an employee that was in the water working on another boat. The officers followed in the direction that the suspect motorboat had fled. After failing to intercept the suspect motorboat before it reached the Tennessee side of the lake, Officers Early and Sheets made contact with officers from Tennessee DNR, and gave them the information on the suspect motorboat. A short time later, Tennessee DNR Officers stopped the boat for a violation of a no wake zone and determined the operator was intoxicated and arrested him for OUI. Tennessee DNR Officers contacted Officer Early with the details of the arrest. Upon completion of witness interviews at the marina, and the information provided by Tennessee DNR Officers, Officer Early was able to obtain and serve a reckless boat operation warrant on the operator for the incident occurring in Virginia. CPOs and K9 Attend Meet and Greet at Cabela’s – On August 10, 2018 CPOs Wes Billings, Matthew Arnold, Cody Hash and K9 Josie, along with Tennessee Wildlife Resources Officer Matthew Cameron attended a meet and greet event at Cabela’s in Bristol, Virginia. The event between DGIF and Tennessee DNR Officers, utilizing the Cabela’s venue was a success with numerous contacts being made and the officers fielding and answering many questions from the public and constituents regarding new laws and regulations, wildlife management areas and boating safety covering both states. CPOs Assist Fallen Elderly Woman – On Aug 11, 2018, CPOs Jim Anders and Eric Rorabaugh were patrolling Wythe Co. and discovered an elderly woman that had fallen and was disoriented. The officers provided assistance and determined she had wandered away from her home nearby. Officer Rorabaugh had a previous encounter of similar circumstances with the same lady. The officers requested assistance from the Wythe County Sheriff’s Office and Adult Protective Services. The officers also contacted the lady’s son and took her to a neighbor house where she was taken care of until the son could arrive. Illegal Bear Kill – On Aug 11, 2018, CPOs Jim Anders and Eric Rorabaugh responded to an illegal bear kill in Bland Co. The officers determined a male subject had killed a bear during the night near his residence. The subject had chased the bear off numerous times and decided to kill it. The subject waited approximately 36 hours before notifying the proper authorities. Bland County Animal Control had also discovered the violation and reported it to DGIF. Appropriate charges are pending. Rocky Mountain Elk Foundation Annual Banquet – On Saturday, August 18th; 2018, Rocky Mountain Elk Foundation held its annual banquet at Noah Horn Well Drilling Corporate Offices in Buchanan County. The annual event serves to raise funds for the REMF and the local Chapter in its efforts involving Virginia’s Elk program in Buchanan County. The Department of Game and Inland Fisheries, the Virginia Conservation Police Association, and many other REMF members and Elk enthusiasts, as well as private corporate sponsors attended the event to show support for Virginia’s Elk Program. Some of the key note speakers included DGIF Board Member Leon Boyd and Department Terrestrial Biologist and Elk Project Leader Dr. David Kalb, PH.D. Department Law Division personnel attending the event included Major Bryan Young, Captain Jamie Davis, Sergeant James Hale, Senior Conservation Police Officer George Shupe, and Conservation Officer Matthew Arnold. Agency staff was able to respond to a wide array of questions related to the Elk herd in Buchanan County, as well as other game, fish and boat questions that attendees had. The many fundraiser events offered at the banquet included silent auctions, raffles, vocal auctions, 50/50, and monetary donations to the local chapter. This Annual Event is crucial in promoting and contributing to the growing Elk herd and The Department’s Elk Project program in Virginia. Captive Deer Relinquished – On Wednesday, August 1, 2018, Senior CPO George Shupe received information regarding a subject that possessed two captive deer in a barn, located in Buchanan County. The information obtained in the case included that the subject identified was going to put some weight on the deer and slaughter them later in the fall. Senior Officers George Shupe and James Brooks, along with Department Wildlife Biologist Seth Thompson; proceeded to the residence identified. Upon arrival, the officers observed the suspect identified in the incident, outside his residence. During a short interview with the Officers, The suspect quickly admitted to the deer being in his barn. The officers proceeded to the barn and located two deer, one of which was a fawn and the other was a four point antlered buck. The suspect interviewed stated to the Officers that he had the buck for over a year. The subject was cooperative and relinquished the deer to Biologist Thompson and the Officers without further incident. The appropriate charge was placed by Officer Shupe. Late Evening Patrols Net Violations at Local Fishing Spots – On August 2nd, 2018 CPO Sergeant Boulanger was on patrol, checking a local reservoir, when he observed a male and female sitting in a parked vehicle on the property. The two individuals made numerous glances towards Sgt. Boulanger, which raised his suspicions that they were engaged, or about to be engaged in illegal activity. Sgt. Boulanger ran the license plate through VCIN and quickly learned that the registered owner had a suspended driver’s license. At this time, the two individuals began to leave the property in the vehicle and Sgt. Boulanger decided to follow them while he waited for DGIF Dispatch to email him a DMV photograph of the registered owner. Sgt. Boulanger was able to determine that the individual operating the vehicle was the suspended owner and conducted a traffic stop. Once Sgt. Boulanger made contact with the driver, he immediately noticed the smell of marijuana coming from the vehicle. Sgt. Boulanger conducted a search of the vehicle and located marijuana as well as several smoking devices. He placed the appropriate charge on the driver. Canoe Party Squelched – On August 5, 2018, Senior CPO Beth McGuire and Sgt. Rob Ham were on boat patrol of Elkhorn Lake in Augusta County. They observed 4 individuals in a canoe paddling towards the boat ramp. The individuals were singing loudly and yelling. When the canoe was approximately 20 feet from the ramp the individuals noticed the two officers standing at the ramp in uniform waiting for them to come onto the shore. The operator of the canoe attempted to turn the canoe around when they flipped the canoe. Two of the individuals had on approved PFDs and one had a child’s superman PFD. The officers assisted the individuals out of the water and noted that all of the subjects were very intoxicated. After getting the individuals to shore, Senior CPO McGuire was interviewing them when one individual fled on foot. The remaining three were taken into custody. Sgt. Ham pursued the other individual on foot but was unable to locate him. The three individuals were charged for drunk in public. The operator of the canoe was charge with additional boating safety violations and reckless operation of a vessel.